Inspired by the highly entertaining exchange between Roudabeh Faghri [Dumber than me] and Siamack Baniameri [Sick and tired], much of which I am assuming (hoping!) was tongue-in-cheek, I thought I&apos;d share a few of my own observations about this whole issue of our identity. I was born in Tehran and raised in west London and of course it is possible to be of both nationalities. If someone treads on my toe, I apologise. That&apos;s the English in me. If a female relative decides to talk about how big my butts got and throw the topic into an open forum, I don&apos;t bat an eyelash. That&apos;s the Iranian in me. The English in me finds it acceptable to drink two bottles of wine and fall asleep in my jeans and the Iranian in me is somewhat disgusted. So you see, one can easily be both. 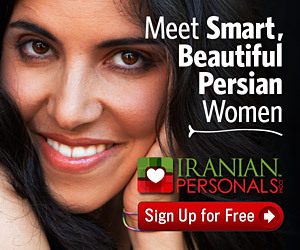 Now and then I meet non-Iranians who are kind of Persian &apos;wannabes&apos;. A woman approached me at a comedy show recently, just as I came off stage. She was an English woman, who, despite it being obvious that speaking English was easier for both of us, insisted on speaking Farsi, the conversation was really stilted and awkward. Not wishing to sound unkind, but this kind of behaviour infuriates me. I politely declined her offer to buy me a drink. She explained that she has been married to an Iranian for years, and therefore knew I was &apos;tarofing&apos;. I wasn&apos;t. I just didn&apos;t want to hang-out. Some people who fall in love with an Iranian and are introduced to our language, food and culture in a superficial way, assume a kind if kinship with every Iranian person they see and embrace all things &apos;Persian&apos;. These are often the people I avoid at parties. People who corner me to talk about Persian mysticism and ask think that every word that comes out of my mouth is linked to the ancient culture of my ancestors. These people often ask me questions about Iran, which are the same as me asking a random Englishman what the population of Manchester is. Don&apos;t get me wrong, I realise that some people just have a genuine interest in anthropology and the history of that part of the world and know twenty times more about my country than I do. These are not the people I am talking about. I&apos;m talking about those who think you will be endlessly flattered and amused to find that they have learned to say &apos;damet garm&apos; and talk about &apos;tarof&apos; as though it is something other than basic politeness as we see it. Equally baffling are those of Iranian heritage who make a song and dance about &apos;not liking Iranians&apos;. I recently struck up a warm acquaintance with a young half- Iranian dentist who came to quite a few of my stand-up shows. We swapped numbers. I invited her to a picnic and she replied that she&apos;d love to come &apos;as long as it&apos;s not an Iranian thing&apos;. I promptly replied that it was actually a National Front event and thought it best she stay away. I don&apos;t know of any people who are as obsessed with their identity as us Iranians/American -Iranians/British Iranians/Anglo-Iranians/Persians/Zoroastrians and various other &apos;ians&apos; that I may have missed. An Argentinean friend of mine noted recently that when ever he spends an evening with Iranians, he is guaranteed that the subject of that evening will be &apos;Iranians&apos;. I jumped to my kin&apos;s defence and enquired why, if it bothered him so, did he spend so much time with us. He answered &apos;the food, of course&apos;. He was forgiven. While I am here, I&apos;d like to address this notion of critisizing elder Iranians for &apos;abusing&apos; healthcare systems. I willing pay my taxes so that any one who needs to use our British National Health Service does so. If we are only to give medical help to those who pay for it, what about the unemployed crack-heads or the weekend drunks who drain our resources every Saturday night? Where do you propose we draw the line? Frankly, if some old guy wants his piles removed at my expense, good luck to him. People who rant about their &apos;rights&apos; when it only by sheer good fortune they are living in the wealthiest nation in the world should have just a little more humility.